← How’s my $100m tax-free account developing? For my net loan to shrink by £10k per quarter, without any margin calls. Q1 was an incomplete quarter. My margin loan kicked off at the end of January, and most of the interest charge was calculated in early March. But even after interest my net loan shrunk by about £10k, because I used some notable dividend payments to pay down a small amount of the margin loan. This goal was met. Moreover, I have also had a significant amount of cash (from an illiquid asset which I sold weeks ago, with a massive lead time, so the cash has just arrived). This cash amounts to about 5% of my portfolio. I have used half of this to repay some of my margin loan. I have used the other half to build my asset base. Overall my Loan To Value has dropped to under a third, and I consider the risk that markets fall enough to force me to sell holdings to now be vanishingly small. I can sleep more soundly as a result. Goal 2: Maintain investment income of £Xk. I’m still gathering the data for this goal. But one thing that’s clear is that income is a very lagged indicator. I received some significant dividends in Q1 from assets which I sold to buy the Dream Home, weeks before the dividend was paid. I won’t receive those again, alas. Overall my income was ahead of £Xk, though the downward trend is clear and will continue. If markets remain where they are now, I shouldn’t have a problem with this goal; if markets fall by a further 20% then I will need to pay close attention. In the meantime, this goal was met. Goal 3: Closely track my target asset allocation. I adjusted my target allocation significantly in January; I wanted to rebalance away from the UK and towards fixed income. But with the market volatility in January I didn’t want to implement this change too quickly. The Dream Home was paid for at the end of January, and the stamp duty followed in February. This has left March to watch the dust settle. I’ve given the dust a helping hand, as I’ve used the month to rebalance somewhat towards my new asset allocation. How have I done? UK exposure has dropped from 56% to 35%. This new exposure is actually underweight, because I’m aiming now for 40%. The overshoot is due to my margin loan being disproportionately in pounds – i.e. my net position is lower than I would like. At least the fall in sterling means my overweight loan has fallen in value too, which is fortuitous. US exposure has risen from 22% to 39%. Again, I’ve overshot a little – because my new target is 35%. The overshoot, again, is due to my margin loan being in the wrong currency mix. At it happens the US stock market and currency have gained versus the UK so this overweight position has helped me. Fixed income has risen from 15% to 43%. This shift is dramatic, with my fixed income holdings almost tripling in three months. I haven’t quite completed my rebalance – I am aiming for 45% – but I am nearly there. Going forward, I will look to define ‘closely track’ as meaning that all of my asset/geographic segments are +/- 2.5% of the target allocation. As of today, the only segments more than 2.5% out are my UK and US loan positions. I am overweight 5% on my UK loan and underweight 7% on the US loan; this leaves me exposed if the pound gains versus the dollar. 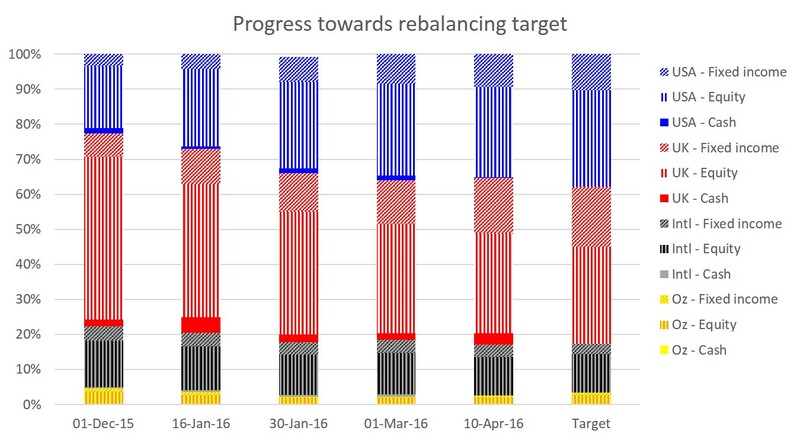 But overall I am very pleased with my rebalancing progress in Q1; my goal is almost achieved. What I’m tracking and sharing here is the performance of my *investment portfolio*. By this I mean my liquid, publicly tradeable holdings held in stockbroking accounts / ISAs/ similar. This does not include property, private/angel investments, which are all illiquid. It also doesn’t include ‘daily spending’ accounts (e.g. current account, credit cards). This is a long way of saying that No, I don’t mark-to-market my home(s! But hopefully not for long) because I don’t track its value. I am reading those same scary things about the prime London property market…. But I do also raise it because of the machinations about the extra debt and raising against an investment portfolio and close tracking of gearing and so forth — somewhat different to Joe 20-something taking out a 30-year mortgage at the start of his career and forgetting about house prices for a decade? Let’s be clear – in no way would I suggest my antics as an alternative to the conventional mortgage route for conventional early-in-career low-net-worth types. But for FI/RE types I hope they might provide some ideas / inspiration / cautionary tales. High net worth personal finance blogger based in London. Interested in financial independence, economics and technology. Does this house really believe it should be included in the FIRE net worth? A WordPress.com Website. Mid Mo Design.